The big story this month for the Kansas City area labor market is the drop in unemployment rate. Without seasonal adjustment, the rate fell from 6.9 percent to 6.1 percent — and while 0.8 might not sound like a lot, when it comes to unemployment rates that's a significant change. We prefer to look at seasonally adjusted data, and that rate also dropped, just not as dramatically — from 6.9 percent to 6.6 percent. 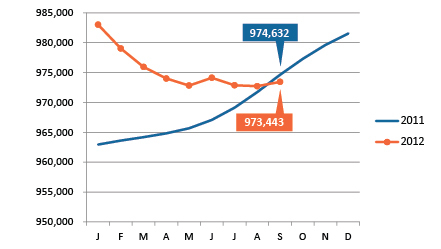 For comparison, our unemployment rate one year ago was 7.9 percent. But just like last month, the lower unemployment rate is due more to a drop in our local labor force than an increase in employment. 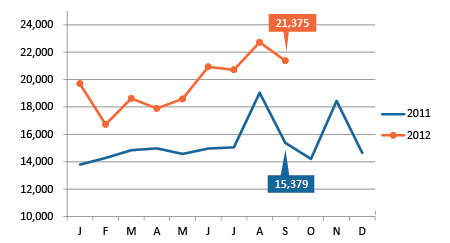 The labor force dropped by almost 3,000 between August and September, and it's down almost 17,000 from one year ago. Seasonally adjusted employment grew modestly in September, by 723, after declining slightly the previous two months. Kansas City’s unemployment rate looks healthy when we compare to other metro areas. Only four of our peer metros have lower unemployment rates. And while help wanted ads dipped from August totals, the number of job postings continues to be well above 2011 levels. The real unanswered question here is what is causing the steady decline in the labor force. The national labor force has increased during this year, while Kansas City’s has steadily declined. Is immigration (or lack thereof) an issue? Are people retiring at a faster pace here than nation-wide? Or is this a data issue? We know that last year our local employment data consistently lagged the nation until it was revised in March. Perhaps we are dealing with a similar issue here. In any case, we will keep looking for answers. Employment nudged up slightly in September, but is now actually below where we were last year at this time. The declining labor force continues to be the biggest driver in the local labor market story. The labor force shrank by nearly 3,000 in September. 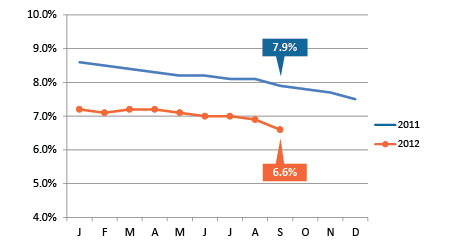 The unemployment rate continues its steady decline and now stands at 6.6 percent. 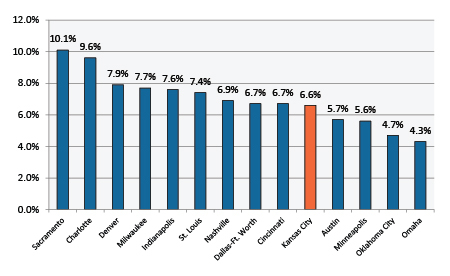 The Kansas City region's unemployment rate is lower than most of its peer metros rate. Job postings may have dipped in September, but posting activity still remains well above 2011 levels. Please join us on Thursday, Nov. 8, from 9–11:30 a.m. at the Sylvester Powell Community Center, 6200 Martway, Mission, Kan., for “What the Numbers Tell Us: The Regional Market for Sustainable Development.” This seminar is an opportunity to discuss new market information developed through MARC’s Creating Sustainable Places initiative. Dr. Arthur C. (Chris) Nelson, FAICP, executive director of the University of Utah's Metropolitan Research Center, will present findings on how market demand is changing due to demographic shifts and other forces. Dr. Nelson has analyzed what these changes mean for Kansas City and what we should expect as we move toward 2040. Melina Duggal, senior principal, and Patrick Lynch, senior associate at RCLCO, a national real estate advisory firm, will present their analyses of national trends in the demand for smart growth and transit-oriented development and assess the preference for these development types in Kansas City. Representatives from the local development community — including Bob Regnier, president and CEO of the Bank of Blue Valley; Walt Clements, director of the Lewis White Real Estate Center, Bloch School of Management, University of Missouri-Kansas City; and Dan Lowe, a partner with RED Development — will discuss what this data means for development in the Kansas City region. There is no cost to attend, but registration is required. Register online or call 816-701-8234. Free parking will be available in the lot east of the community center, across Beverly Avenue. For more information, contact Jeff Hirt, 816-701-8305 or jhirt@marc.org.